Five crew members have been killed and three are in hospital after an accident during a routine lifeboat drill on cruise ship Thomson Majesty. The boat plunged into the water and capsized during a safety exercise while the ship was in harbour at Santa Cruz de la Palma in the Canary Islands. The ship, owned and managed by Louis Cruises, is chartered to Thomson, and is one of five ships in their fleet. Majesty has been sailing seven-night cruises to the Canary Islands, Madeira and Agadir throughout the winter season. 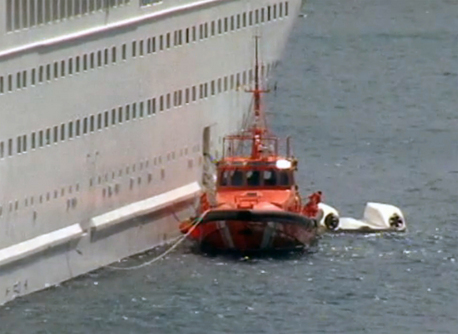 None of the 1,500 passengers on the ship was involved in the incident, which happened at 12.50 a.m. local time. A winch lowering the lifeboat from its davit six decks above the water line is believed to have failed. The dead crewmen are believed to be three Indonesians, a Filipino and a Ghanaian. It is understood that two Greek seamen and one Filipino were injured. Thomson Cruises said: “We can confirm that there have sadly been five crew fatalities and three crew members injured. One person has been discharged from hospital and we expect the other two people to be released from hospital imminently. Our thoughts are with the families of those involved. The 40,800-ton ship, which originally entered service in 1992 with a maiden voyage from Southampton to New York, was christened Royal Majesty by singer Liza Minelli.